1) Pause now and then – allow your words to “land”…wait before answering the question you just asked! 2) Listen more than talk – someone told me that we were given two ears and one mouth for a reason! 3) Avoid the “What’s wrong?” question….It only irritates the introvert because usually nothing is the matter. 4) “Praise in public, reprimand in private” usually makes sense. However, a lot of introverts don’t want the spotlight on them so consider giving them kudos one on one and letting others know about their achievements through email. And for you introverted leaders, here are some tips for you to rise up and shine by using your natural strengths. This entry was posted in General on June 25, 2009 by Jennifer Kahnweiler. I am responsible for delivering meaningful and innovative resources to our experienced MBA students to help them achieve their career objectives. Enter Jennifer Kahnweiler! 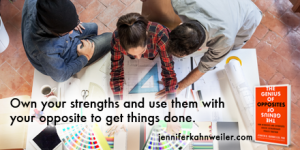 Our students have raved about their experiences in Jennifer’s workshops, and they especially appreciate the effort she puts forth in customizing her presentation to their specific needs. I’ve learned a lot from her myself and look forward to working with her again in the future!